Dr. Montessori wrote, "Education is a natural process carried out by the child and is not acquired by listening to words but by experiences in the environment." See why it's good to be "Different." 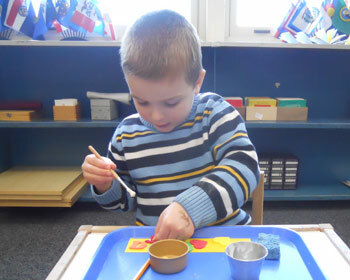 Montessori materials lead the child gradually from concrete concepts to abstract understanding. The curriculum spirals on itself, picking up on direct and indirect preparations for each new step, widening and deepening the child’s knowledge as it continues. The curriculum becomes increasingly integrated, so that what most adults call “subjects” are rather facets of a larger design. While children integrate their learning experience, adults tend to separate learning into “subjects.” We have thus divided the program to guide you through it, but must emphasize that each experience involves many areas of knowledge and has many links. San Lorenzo Montessori believes that children learn in different ways and at their own individual pace. All areas of the classroom are interwoven, not taught in isolation and each child can work on any material they are ready for at any time. Practical Life activities are basic, vital, and continuous though they grow more complex through the stages of a child's life. They appeal to sensitive periods for order and for the control and perfection of movement. In the primary class much of the practical life has to do with adapting to one's own culture. Children learn to snap, button, tie bows, shine shoes, scrub tables, dust, polish and sweep, sew and cook. They also learn forms of good manners in our culture, such as shaking hands, closing doors quietly and not interrupting. These activities are designed in a sequence of steps, through which the child comes to realize order and logic in activity. Concentration, carefulness, exactness and coordination, independence, social awareness, helpfulness and self-esteem are some of the qualities that grow through this work. Sensorial materials appear only in the primary class. The children are passing through sensitive periods related to perception of their five senses. Children begin to use texture, color, weight, smell, sight, taste, and temperature to take in new information. The materials are not intended to give new impressions, but to name, order, classify, refine, explore and bring to a conscious awareness the sense impressions the child already has. The sensorial materials serve as keys to other areas of learning. The sound exercises lead into music and composition. Texture is used giving shapes of alphabet letters. Discrimination of forms extends into geometry, botany, geography, and so on. The language of the material is usually given after the child has explored the concrete concepts. 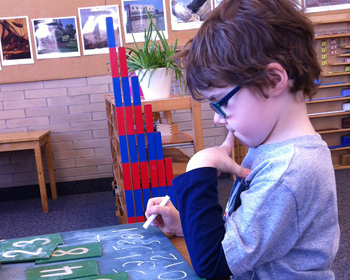 Language is carefully interwoven throughout the Montessori program. Our curriculum introduces language through enrichment of vocabulary using classified cards and sensorial materials. The aim is to increase children's knowledge, organizations of thought, and confidence in the ability to use and express their minds. With sandpaper letters, children sensorially learn the cursive form and phonetic sounds of the alphabet. They make words with a special cursive moveable alphabet and "write words" before they realize that the words can also be read. After this discovery, materials and various games lead the children through cursive to print, and from phonetic reading to "total reading". Our mission is to delight the children with the magic of language, not to pressure them, therefore, not all this work is accomplished in the primary classroom. Numbers are introduced using concrete materials allowing the children to see large and small quantities. Mathematical operations are explored through units, tens, hundreds and thousands. The goal is an understanding of the operations, rather than rote memorization of facts. History, geography, botany, zoology, physical sciences, music and other general subjects are first presented to the children through stories. In botany, for example, the children analyze a real plant into basic parts: corolla, calyx, stem, leaf, roots. Science exploration is designed to cultivate a child's fascination with their surroundings and by introducing the elements of science at an early age children will develop a lifelong interest in nature and the environment. Geography, history, and the arts play an integral role in the Montessori curriculum. The Prepared Environments are aesthetically pleasing and enriched with fine art, crafts and music. 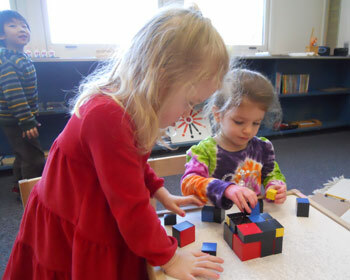 The children's own creative energy is used everywhere in the program as they discover and explore their interests. Paintings, writing stories and music all begin in the primary class and help the child develop control of their fine and gross- motor development. Various cultures are presented respectfully, through stories and collections of pictures, music and celebrations. Religion: Montessori has been used in schools of all the world's major religions, but the Montessori program itself does not have a specific religious persuasion, nor do the classrooms. Religions of the world are discussed in multi-cultural studies. Parents are invited to contribute to the celebration of their religious holidays in their child's community. Classroom materials encourage and help the development of movement. In the primary class, children are interested in refining the skills they acquired during their first years, and encourage work on developing precision and control of movement. Children spend time outdoors each day, weather permitting. There are no grades, or other forms of reward or punishment, subtle or overt. Assessment is by the teacher's observation and record keeping. The test of whether or not the system is working lies in the accomplishment and behavior of the children, their happiness, maturity, kindness, level of work and love of learning.